I feel like I should write an ode to tulips. 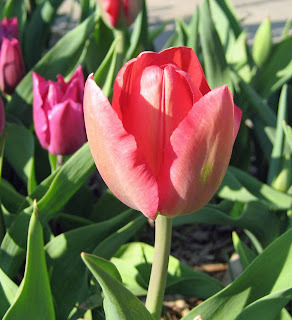 While other flowers and shrubs and trees have succumbed to the freezing temperatures, the tulips have carried on as though it is no big deal to be frozen at night and then thawed out each day. I don't care if they behave like annuals, I'll plant them every fall just to get this kind of display in the spring, because at least for that first year, they are reliable. This is one of the orange tulips. And below is one of the pinkish-purple tulips still blooming. I finally found the packages for my tulips and it turns out, ha ha, hmmm, that I should have expected this pinkish-purple color because it is exactly what is on the package. I apologize to the tulip and the tulip grower! 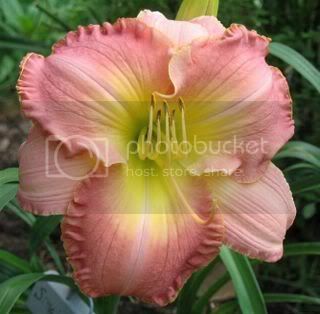 But I won't apologize for not expecting this next color starting to bloom. Look, it's red! These will go well with the orange tulips, don't you think? After looking at the packages, it appears that I should also expect some green and white striped tulips to come up someplace. I don't know if they will be in this bed or someplace else. Honestly, I don't remember where I planted them. I'm slipping in my record keeping! But I did keep a record of when I planted the early vegetables (March 17th), and I labeled each row. 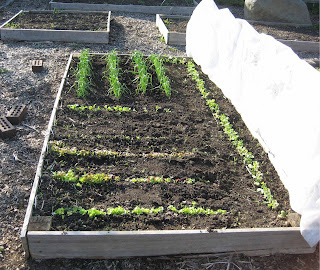 I checked under the row cover this evening and found lettuce, radishes, spinach, onions and peas all sprouting. The beets did not make it, so I'll have to replant those. 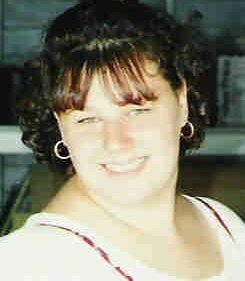 I'll do that this weekend when I thin out the lettuce. I also need to figure out how I am going to keep these all covered so the rabbits don't eat everything. The onions are already bent over because they are hitting the cloth and can't grow taller. And once the peas get taller, I need to set it up somehow so that they can climb the trellis that the cover is draped over in the picture above, and still be covered. I know I have to do this because there is another bed in the garden where I also planted peas, but didn't cover them, and there is not ONE single pea plant in that bed. Not a single one. I can only assume that the rabbits ate them all. And the rewards of gardening? Look below, I found an Easter egg. I can't believe this one wasn't found. 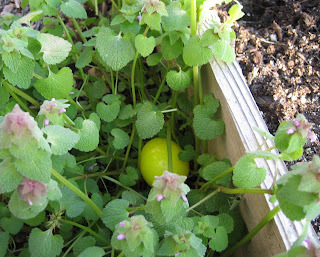 Really, some of my nieces and nephews have been hunting eggs for years and have no excuse for not finding this one. 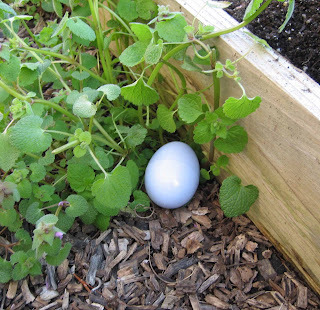 And then I found another egg! Those nieces and nephews are really slipping. You don't suppose it has anything to do with hunting for eggs when it was in the high 30's outside, do you? They were really hustling out there. But would either of these be a money egg? But then, Jackpot! A money egg. $1.05. See, gardening has its rewards! You always find something nice in the garden on a sunny evening. Maybe it is just a pretty orange tulip with the sun shining on it, or maybe it is a leftover Easter egg with money in it, but you'll always find some reward for your efforts in the garden. Hi Carol- I loved reading your post today! Very nice! Hey those veggies sure look good. Oh, I am so envious. I don't have anything planted in the garden yet, and yours looks so nice. The sad thing is, that it is just dry enough now to get in there and work the soil, and it's supposed to rain tonight. Drat!! I will probably not get back in there for a week. 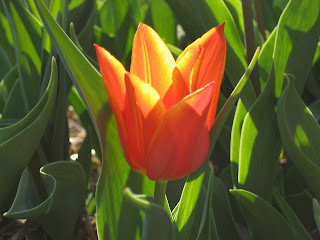 I love that first tulip, the orange one with the light shining through the petals. I've never grown tulips but masses of them certainly are lovely. Maybe the rabbit is leaving you a tip?? I hope it's 20% considering all your work! 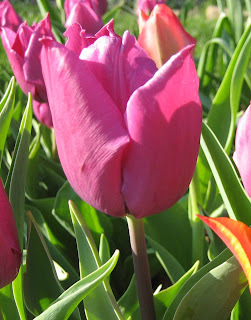 Your tulips are so nice, in the spring, I think orange and pink go very well together! Treasure indeed! It sounds like you had a good day of gardening. Your vegies look so wonderful coming up...I hope you can protect them from the bunnies! Carol, I'm so glad your tulips are blooming for you. Mine have perked up too. 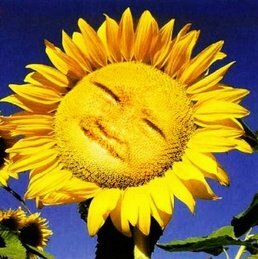 Wasnt' it beautiful today? A little nippy, but so nice to be outside again. You hit the jackpot, Carol, good thing you were looking so carefully amongst all your plants! As for the orange tulip next to the red tulip, go for it. For years I picked all the orange poppies so they wouldn't clash with the pink ones next to them and one year I suddenly realized I liked the combination! That was after I got over my philosophy of only "pale hues" in the garden. Hidding treasure in your garden? Not bad Carol. ;-) BTW nieces and nephews aren't what they used to be, are they? You've done a lot of work on your veggies with the sowing and all. Have you thought of a cunning plan to keep those rabbits off your veggies? Luckily I don't have a problem here with rabbits but I got slugs and snails. At least rabbits are pretty to look at, even if they are munching on your carrots. I just love all of the tulips. I hope at least a couple of mine bloom after our snow/freeze. They're still not looking very good. I'm envying your veggie garden, as well. I have got to get out there and start planting! If you would like to borrow our dog for the day, I'm sure your rabbit will be scared far enough away to never come back. I still think you need to put up a mesh all around the lower half of your wrought iron fencing. That would at least help some. Or how about some kittens? 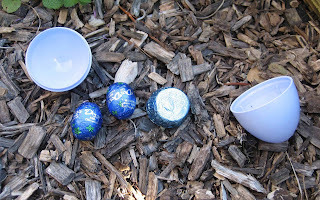 I have to say that my 3 are the youngest of the neices and nephews, so they don't have the years and years of experience egg hunting that the 20 somethings have -- what's wrong with you kids??? Leaving a money egg....and 2 of you are getting married - you need all the money you can get! Carol: The only solution to rabbits, I've found, is to have a physical barrier. Last year I bought 24" wooden stakes and 36" window screening. I folded the screen in half and power-stapled it to the posts. Even though the fence was only 18" tall, it kept the rabbits out of all beds except one. They were able to climb over the potato plants that were leaning out of the fence and were very close to the ground and get into that bed, but luckily didn't eat anything. I must warn you, this is not a very pretty solution, but I liked it better than wire fencing because I didn't get pricked and poked every time I leaned over to do weeding. I was hoping to come up with a better-looking fence this year, but haven't yet. I am glad to see that your tulips survived the frost. Your veggies look delicious - at least they survived. Snow and freezing temps here so gardening still has not begun. I'm reading instead ... the Passalong Plants is a good read. 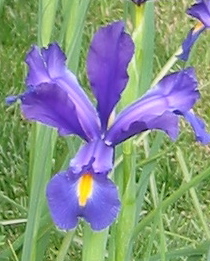 First time visiting your blog and I enjoyed my time here...your flowers are beautiful. I'm also surprised to see the tulips in our neighborhood standing tall after the freezing temps. That I didn't expect! Your Tulips are lovely and tuff. I bought some two years ago from Costco that came up again this year with a vengeance. I never expect them to come up again. They are this gorgeous peachy color and they've lasted a couple weeks now. $1.09 in your money eggs? That's pretty good. The most my kids got was $.50. I'm going to send them to your house next year. Don't worry, they'll find all your eggs. All... thanks for all the nice comments about my tulips and vegetables and the tips on how to keep out the rabbits. 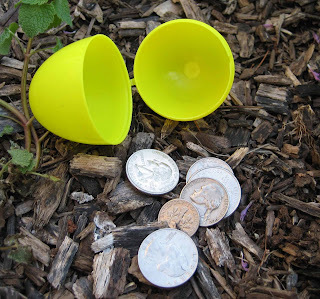 I couldn't get out into the garden today... rain... but when I do, I'll be looking for more money eggs! I love early spring vegetable gardens - when the rows are so clearly delineated and the plants are such a fresh green - your raised beds look so nice! My sugarsnap peas are already two feet tall, I'm harvesting spinach, and the brocolli is long gone. If we don't get out crops in early, the heat of summer ruins any chances of a harvest. I can offer no good advice for the rabbits, unless, of course - you want to borrow my dog Stanley. He seems to keep all sorts of things at bay in my yard, especially if given treats and a little encouragement. Money eggs! Imagine that! Your veggies look mighty fine! Love the tulips...they are just so cheery! Saw your little poem over on YE's...you are very clever! It made me laugh! Sorry about your rabbit woes...before my cats, I never saw a tulip bloom...and they had radar for the saffron crocus!